Preventing SQL injection while using objects from these libraries is described here. RowSource property of a field in a table or query -- part of the definition of the default UI control used for the field; works like ListBox.RowSource / ComboBox.RowSource. 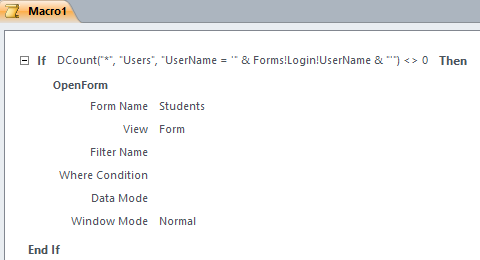 frm.RecordSource = "SELECT * FROM Students WHERE FirstName = '" & InputBox("Enter student's first name") & "'"
If the user inputs ' OR '1 into the InputBox, all the records from Students will be returned. If the user inputs ' OR '1 then the expression will always evaluate to True (as long as there are records in the Users table). vb TempVars!StudentFirstName = "Robert' OR '1"
or the SetTempVar macro action.